The Mazliah family of Givatayim contacted a representative of the Israel Antiquities Authority and invited him to their home in order to examine numerous metal artifacts that were in the possession of their father, the late Marcel Mazliah. The family explained that their father, who was employed at the Hadera power station since its construction, retrieved many items from the sea while working there, which according to the family are quite ancient. The representatives of the Israel Antiquities Authority were surprised by what they found: metal objects, most of which are decorated, that apparently fell overboard from a metal merchant’s ship in the Early Islamic period. According to Mrs. Ayala Lester, a curator with the Israel Antiquities Authority, “The finds include a toggle pin and the head of a knife from the Middle Bronze Age (from more than 3,500 years ago). The other items, among them, two mortars and two pestles, fragments of candlesticks, etc. date to the Fatimid period (eleventh century CE). The items were apparently manufactured in Syria and were brought to Israel. 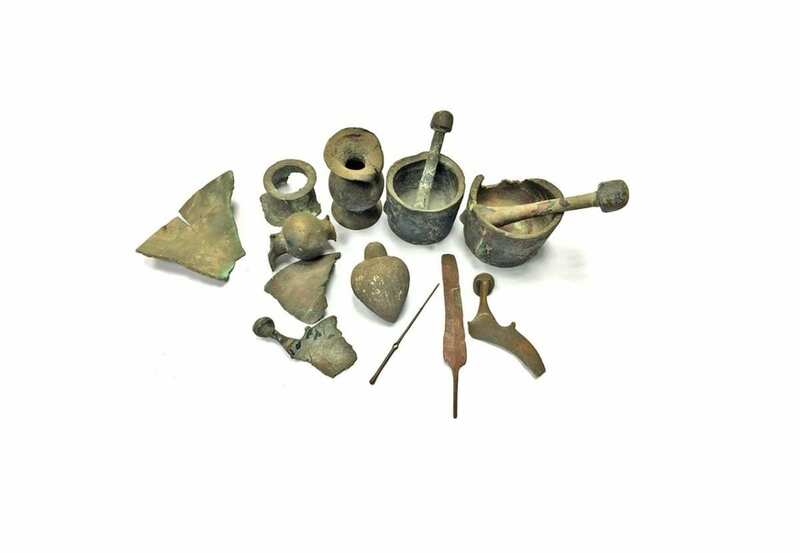 The finds are evidence of the metal trade that was conducted during this period”.